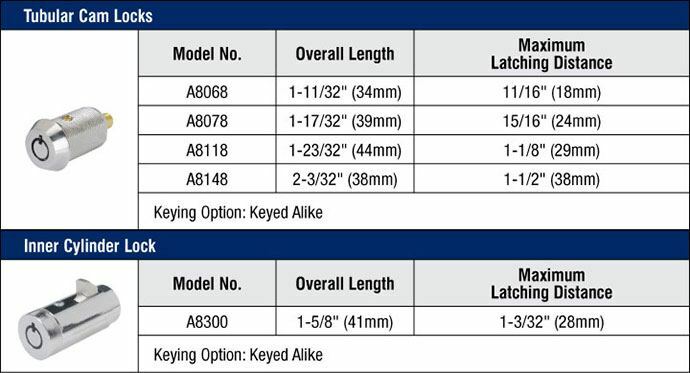 - Delivery: The American Lock A8078 Cam Locks are factory-ordered, please allow an estimated 3-4 weeks' lead time. Made of hardened steel, these seven-pin tubular cam and inner cylinder locks provide outstanding security, offer more than 50,000 key changes and meet National Automatic Merchandising Association (NAMA) requirements. The cam itself acts as a locking bolt and is directly operated when the key turns the plug. Circular seven-pin tumbler design deters picking and is suitable for laundry facilities, vending machine or arcade coin boxes, cabinets and desks, burglar alarms, currency chargers or cash drawers. Each package contains: one lock, 3/4" (19mm) nut, one stop plate, one lock washer, one 9/32" (7mm) nut. All items come in standard 12 o'clock orientation. - 7-pin tubular cylinders offers outstanding security with over 50,000 key changes. - Products meet NAMA standards. - Hardened anti-drill steel security pin. - Removable flat and offset cams offer application flexibility. Maximum Latching Distance: 15/16" (24mm). Keying: Choose between Keyed Different (KD) and Keyed Alike (KA). All A8078 Cam Locks come with 2 keys. Special Ordering: If you require the No. A8078 Cam Lock keyed to an existing key number please leave a note in the Comments Box upon checkout (you can also immediately reply to the Confirmation E-mail with special order instructions).